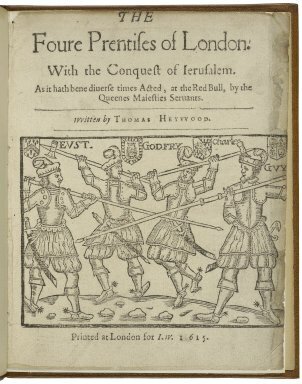 THE Foure Prentises of London. VVith the Conquest of Ierusalem. As it hath bene diuerse times Acted, at the Red Bull, by the Queenes Maiesties Seruants. Printed at London for I. W. 1615. Title page imaged from Folger call number: STC 13321. Image is not from the transcribed copy.